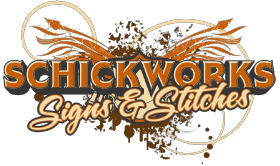 Whether it’s a new logo design, hand-carved signs, or custom apparel for your team, Schickworks can provide you with professional digital printing services and more. We’ve worked with many businesses in Williams Lake and in the Cariboo. Take a look at our past work and let us know if you have any questions or need more information about our services.